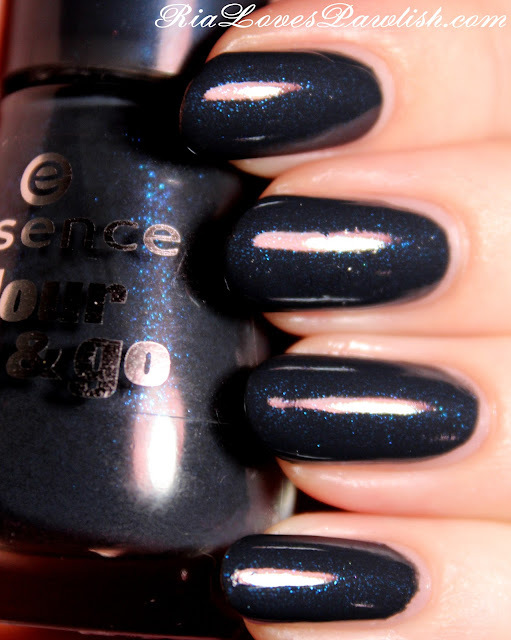 today's polish is Essence Date In The Moonlight from their Colour & Go line. this is my time ever trying an Essence polish... and i am blown away! the quality is absolutely INSANE. the polish only cost .99 cents and equals polishes that cost multiple times that amount! i will definitely be picking up others i see... at .99 cents, you can't go wrong. Date In The Moonlight is dusty dark blue with subtle sky blue shimmers. i really love it, i only wish the shimmers were more visible! the formula is outstanding, complete coverage in two coats that practically apply themselves. the brush is a nice wide brush that you would generally see in polishes with a much higher price tag... yep, i'm wowed!! it isn't super shiny on its own, so it benefits greatly from the addition of a shine topcoat. two coats Date In The Moonlight, one coat Seche Vite. i was totally blown away by this polish!